BRIGHTON, Mich. - Ford Motor Company is constantly evolving to make their customer’s lives easier and more manageable, and their new Remote Access application does just that. Ford can now turn your Smartphone into a virtual keyfob with Ford Remote Access Application. For select Ford and Lincoln vehicles, this new Remote Access application uses your phone to take these vehicles into the future with mobile technology. 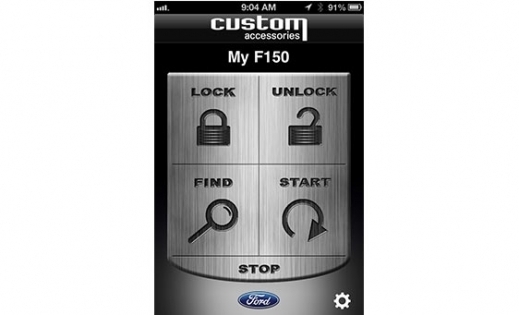 This application from Ford Custom Accessories turns your Smartphone into a virtual ‘keyfob’ with Ford Remote Access Application. This app allows you to control your car, giving you the ability to lock, unlock and even remote start your car from a distance. Since it works via satellite, you could even start your car from across the country! The app also has a Find feature to help you locate your car (don’t worry, it happens to all of us). If you can’t find it, the Remote Access app can at least let you know it’s safe with optional email/text security alerts. That way, no matter where you parked it you will know if there’s a security breach. If you’re disappointed because you think that this Remote Access application can only be added to new models, that’s not the case! Even if your vehicle is a couple of years old, the Ford Remote Access app can easily be added to Ford and Lincoln models at the dealership. So whether you’re in the market for a used or new car, this feature can still be installed in your vehicle. We have a wide selection of certified pre-owned cars for sale at our Pinckney used car dealership. As of right now, the Remote Access system is available on the 2011 or newer Super Duty, Edge, Explorer, F-150, and Lincoln MKX. You also have the option to purchase the application if you drive a 2013 model year or newer Taurus, Flex, Lincoln MKS or Lincoln MKT. You can find all of these vehicles and more with Brighton Ford, Pinckney area Ford dealer. Love this application!!! This works incredible on my 2011 Ford Explorer. I live in Chicago and this winter has been one of the most noticeably bad in quite a while. This application hasn't fizzled me once. I'm cheerful that at well beneath solidifying temps my car is dependably toasty warm. Would be decent in the event that it had a custom clock so I could have the car running automatically @ sure times amid the day.